Does your organization depend on Exchange Online email services to run business and share sensitive data? If so, you need to make sure your critical assets are well protected and users have reliable access to their mailboxes and their content. For example, if someone reads emails from the CEO’s mailbox or changes permissions to a shared mailbox, you need to know about it as soon as possible. With detailed Exchange Online reporting at your fingertips that empowers you with far more capabilities than native functionality has to offer, you can identify threats and investigate incidents in minutes, thereby ensuring the uninterrupted availability of your email service and the security of your sensitive content. To watch over the activity across your Exchange Online, you can begin by using the native capabilities. 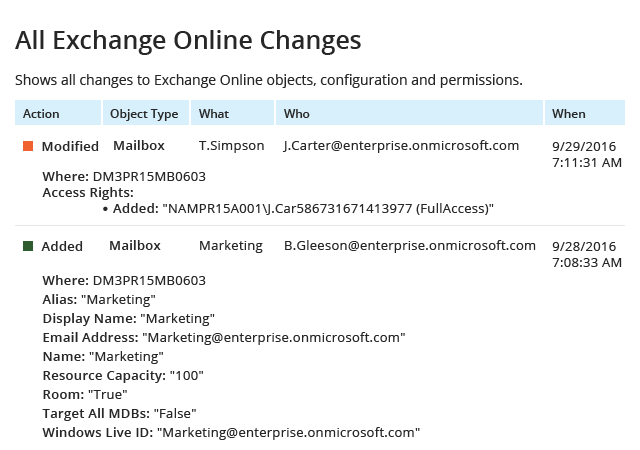 The Office 365 Security and Compliance Center provides Exchange Online reports on access events and changes, search through mailbox content, activity alerts on specified actions, and mailbox content archive capabilities for future eDiscovery. But what if you know exactly which reports on Exchange Online activity you need to review regularly to ensure no unauthorized changes or access occurred, and you want to have these reports delivered to you on certain days? Unfortunately, you won’t be able to simplify your reporting with native features, because you can’t subscribe to specified reports. Here’s another drawback. Suppose you’ve spotted an access to the CEO’s mailbox performed by a user who should not have such access. You need to quickly find out how that user gained permissions to the mailbox and exactly what actions he or she performed in the mailbox and across your other cloud-based systems. If all you have is the native functionality, you’ll have to review numerous reports on activity across every system to drill down to the root cause, find out what else this user managed to do and put the pieces of the puzzles together. This lack of search functionality and a unified trail of a specific user’s activity across other systems increases the chances that the issue may remain unresolved — putting data security into jeopardy. On top of that, you may be unable to find historic data you need for in-house investigations, and you will likely be unable to prove to auditors that you keep your Exchange Online audit trail securely archived for a number of years, as required by many compliance mandates. Because the Office 365 Security and Compliance Center is able to retain your logs for only 90 days, there’s always a risk that older logs will be automatically deleted, wiping out audit data that you may need. Tired of wasting time manually generating Exchange Online reports to determine who did what or figuring out how to keep your Exchange Online audit data safe and compliant with multiple tools? Netwrix Auditor for Office 365 helps you spot and block emerging threats across your Exchange Online, SharePoint Online and OneDrive for Business; streamline reporting and investigations of incidents to protect your critical content; and make sure your email services are available 24/7. Identify suspicious activity across Exchange Online, SharePoint Online and OneDrive for Business by regularly reviewing Office 365 activity visual dashboards and built-in reports. Subscribe to the predefined reports that you find most useful and have them automatically delivered to your mailbox according to the schedule you set. Speed investigations and audit preparation by quickly searching through audit data from all your most critical systems to get to the root cause of an issue or to find the exact information you need. Stay notified about the activity you deem risky with custom alerts on threat patterns. Keep your consolidated SharePoint Online, Exchange Online and OneDrive for Business audit data securely for over 10 years in the cost-effective two-tiered storage (SQL database + file-based) and access them easily during any future audit check or investigation.